Welcome once again to another issue of ‘The Otorhinolaryngologist’. We continue to put together a mix of review articles across the breadth of ENT such that the journal appeals to all of our specialist and general ENT practices. I do hope that you enjoy reading the variety of articles in the journal that Sanjai and I spend time over choosing and coordinating. This review will familiarise the reader with the normal radiological anatomy of the temporal bone as demonstrated on high-resolution computed tomography (HRCT). In addition, common pathology affecting the temporal bone will also be presented. The reader will be shown a systematic approach to viewing HRCT of the petrous temporal bone. Is The University Of Pennsylvania Smell Identification Test (UPSIT) Valid for the UK Population? Aims: UK publications base evidence on University of Pennsylvania Smell Identification Test (UPSIT) results, yet UPSIT normative values are not transferrable outside the USA. This study was designed to (a) Estimate normative scores for the UK population and (b) Identify smells causing cultural bias. Methods: The UPSIT test was applied to 44 healthy individuals in the UK. Results: Results showed a mean score of 32.36(males) and 33.27(females), equivalent to an UPSIT olfactory diagnosis of ‘mild microsmia’ (p<0.05, p <0.0005 respectively). Six smells were identified as culturally biased and removed resulting in diagnosis of ‘normosmia’( p=0.1). Conclusions: The present UPSIT test needs to be adapted to produce a reliable, validated and culturally appropriate olfactory test for use on the UK population. Chemoradiotherapy is an organ sparing treatment for advanced head and neck cancer. However, it can have short and long-term effects on basic functions such as swallowing. Eating and drinking is an important issue for patients and their quality of life. Early posttreatment effects include mucositis, oedema, xerostomia and taste changes, making swallowing painful and secretion management difficult. Long-term effects include fibrosis and persistent oedema, which compromises swallowing ability with patients at risk of aspiration, dependency on feeding tubes and nutritional deficiency. Depending on its severity, dysphagia can lead to serious medical problems such as pneumonia. This article aims to review swallowing assessment procedures, common features of a post-chemoradiotherapy swallowing impairment and rehabilitation. Injection laryngoplasty is a surgical procedure that has gained popularity in recent years owing to its low procedural cost, technical feasibility and clinical efficacy. It provides functional voice improvement to patients with glottic insufficiency and can also be use as an adjunct to laryngeal framework surgery. The purpose of this article is to provide a guide to patient selection, various injection materials as well as injection approaches for this procedure based on current evidence as well as our experience in this procedure. Objectives: To report on a patient who underwent a total thyroidectomy and re-presented three weeks later with significant subcutaneous emphysema due to a tracheal perforation. Case report: A 42 year old man underwent a thyroidectomy to remove a papillary carcinoma. He re-presented three weeks later with a fluctuant anterior neck swelling which was reducible and increased in size on raised intra-thoracic pressure. A lateral neck x-ray showed a large pocket of air and a subsequent CT scan showed a small defect in the anterior tracheal wall. This was visualised with a rigid bronchoscopy and found to be a pin-sized perforation. The patient was managed conservatively and the swelling resolved over a period of 2 to 3 weeks. Conclusions: Delayed post thyroidectomy tracheal perforation is a very rare complication. In this case the patient had no respiratory compromise and so conservative management was seen to be the best management option. Laryngeal nerve damage is a serious complication of thyroidectomy. We present a closed-loop audit of pre-operative fibreoptic vocal cord checks to determine whether implementation of a rapid-access otolaryngology voice assessment improves the rate of pre-operative checks. Data were collected retrospectively from thyroidectomies performed within the Brighton and Sussex University Hospitals Trust over one year. 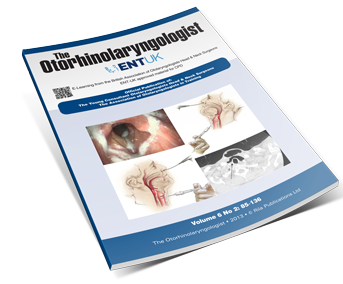 Data were analysed, a rapid-access otolaryngology voice assessment service instigated, data disseminated to both ENT and general surgery departments, and a re-audit performed over the subsequent six-month period. Pre-operative vocal cord check rate increased from 87.6% to 92.3%. Post-operative documentation of voice increased from 68.5% to 96.1%. The voice assessment service improved the trust's preoperative assessment of vocal cords by facilitating easy access to flexible nasoendoscopy. This station relates to the subject of benign paroxysmal positional vertigo (BPPV). The Intercollegiate Surgical Curriculum Project (ISCP) curriculum for Otolaryngology has been updated and all ENT trainees, whether in Core Training, Higher Surgical Training or in Locum Appointments, should follow the 2012 edition as instructed by the General Medical Council. 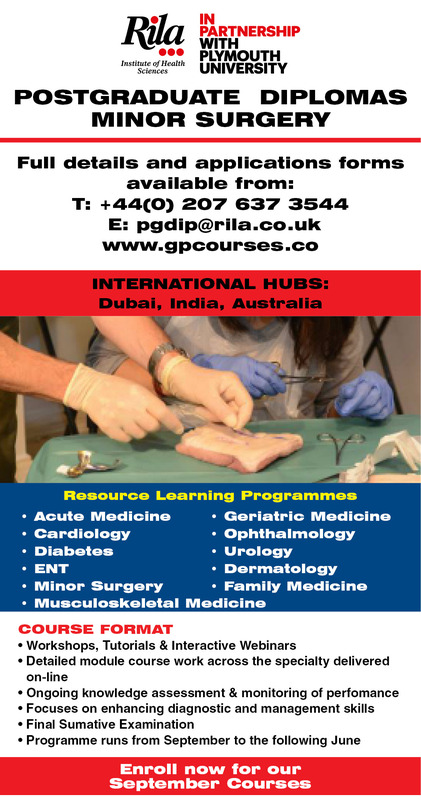 It is often easy to overlook the Professional and Leadership skills, as we strive to improve our surgical skills and decision making, but we should be mindful that these objectives must also be met by our Certificate of Completion of Training (CCT) date with explicit guidelines on Management and Leadership on the CCT Checklist.